When a federal appeals panel struck down a North Carolina voter ID law last month on the grounds that it was designed by the Republican legislature to suppress black and Hispanic turnout, the issue of minority access once again took center stage in the U.S. election. 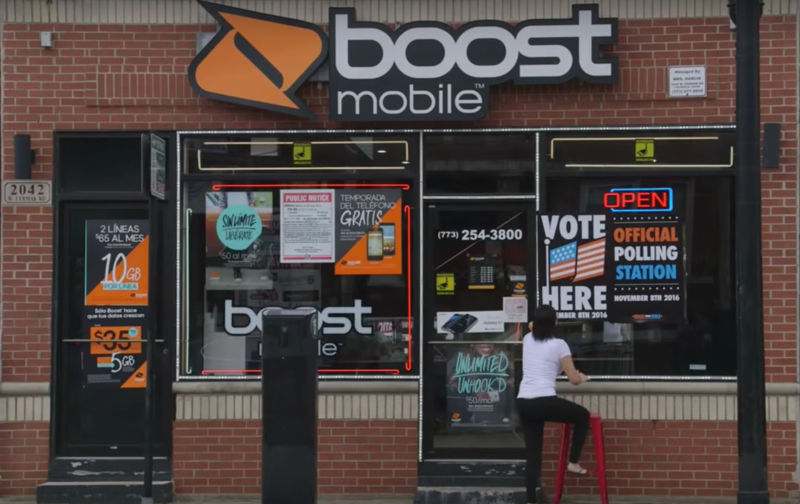 Now, Boost Mobile is wading into the polarizing fight with a campaign that seeks to increase access to polling stations for minority and low-income Americans. On November 8, five Boost Mobile storefronts in areas with large minority populations will becoming polling stations so residents can place their votes. Boost Mobile’s "Boost Your Vote—Equal Access for All", created with Santa Monica-based agency 180LA, calls upon U.S. citizens to pressure election officials for more polling stations. Boost Mobile claims to be the first brand ever to turn its stores into official voting stations. "We saw a problem: Boost Mobile customers, traditionally low-income and minority Americans, not being represented in the American election process," said Boost Mobile Director of Brand Strategy Peiti Feng. "After a little digging, we realized barriers to voting were a systematic issue, in part caused by lack of polling locations and resources in these communities." According to the United States Census Bureau, 98,041 white Americans turned out to vote in the presidential election of 2012, while there were only 17,813 Blacks, 11,188 Hispanics and 3,904 Asians. "Boost Mobile stores are located in these communities and customers routinely visit the stores on a weekly and monthly basis," said Feng. "So turning stores into polling places makes a lot of sense when underserved voters are the customers they serve." The effort is what Tylynne McCauley, 180LA’s associate creative director, calls a "top-down and bottom-up push." The brand has extended the offer to 817 county election boards and has also reached out to secretaries of state, who can encourage participation. "Polling places are determined on a county level, so it’s county-by-county outreach," said McCauley, "Each county election board has their own system and requirements for determining polling places." Orange County, for instance, relies on the community to provide more polling places, whether it’s a business or home that is donated, since there is often a "limited amount of space in a precinct," according to the Orange County Registrar of Voters website. There is, however, a list of requirements that the locations have to follow: the room has to have 600 square feet of space and room to accommodate at least six to 12 electronic voting booths. The county also compensates people that offer up their businesses or homes with $50. Orange County is one that has already signed on with Boost Mobile. Three others—Riverside, and San Diego in California and Cook County in Chicago—have also joined. The five stores that will open for voting on November 8 are all in multi-cultural neighborhoods, and Hispanic residents represent 30% to 60% of each city’s population, according to McCauley. Even getting each individually owned store to participate took a long time. With just over 5,000 stores in these 817 counties, 180LA and Boost Mobile began reaching out in June. To get the process going, the brand is conducting a number of activations around the "Boost Your Vote" campaign. A video, which is shared online and social, works to get the word out. The website also functions as a polling place locator, whether it is a Boost Moblie store or not, all stores that serve as polling places are giving our buttons, posters and T-shirts and the brand made a petition on change.org to put pressure on officials. Boost Mobile is also partnering with social influencers including rapper Murs on Instagram to promote a "Voter" as an identity, according to McCauley. Dearest America, have you learned nothing from Brexit?